Belle Starr (born Myra Maybelle Shirley) was a notorious American outlaw. Born in Carthage, Missouri, her family owned an inn and she was given a classical education and learned piano, graduating from Missouri’s Carthage Female Academy—a private institution that her father helped found. She was an exceptional student and excelled at reading, spelling, grammar, arithmetic, deportment, Greek, Latin, and Hebrew. After a Union attack on Carthage in 1864, the Shirley’s moved to Scyene, Texas. According to legend, it was at Scyene that the Shirley’s became associated with a number of Missouri-born criminals, including Jesse James and the Youngers. During the Civil War, Belle Shirley reported the positions of Union troops to Confederacy. One of her childhood friends in Missouri was Cole Younger, who served in Quantrill’s guerillas with Jesse and Frank James. After the war these men (and later Cole’s three brothers, among others) turned outlaw—notorious for robbing banks, trains, stagecoaches, and people. In their flights from lawmen they would sometimes hide out at the Shirley farm, through which Belle became very tight with the James and Younger gangs. In 1866, Belle married James C. “Jim” Reed, a former guerilla whom she had known since her childhood. Rosie Lee “Pearl,” their daughter, (later rumored to be Cole Younger’s child) was born in 1868 and their son James Edwin “Ed” was born in 1871. While Jim initially tried his hand at farming, he grew restless and fell in with the Starr clan, a Cherokee Indian family notorious for whiskey, cattle, and horse thieving in what is now Oklahoma. Then in 1869, Jim shot and killed the man who, allegedly, accidentally shot his brother in a fight. Wanted by the law, he fled to California with Belle and Pearl in tow. Here two years later Jim again ran afoul of the law for passing counterfeit money and with Belle, Pearl, and newborn son Ed, fled to Texas. In November 1873, Jim Reed with two other men robbed Watt Grayson, a wealthy Creek Indian farmer in the Indian Territory, of $30,000 in gold coins. Belle was named as an accomplice; however, there was very little proof of her involvement. Nonetheless, they both went into hiding from the law in Texas: Jim in the town of Paris and Belle and the children with her family in Sycene. She spent much her time in saloons, drinking and gambling. At times she would ride her horse through the streets shooting off her pistols. This wild behavior helped bolster her image as a pistol-wielding outlaw and hooligan. In April 1874, Jim held up the Austin-San Antonio stagecoach and robbed the passengers of about $2,500. A price of $7,000 was placed on his head and he went into hiding. The law caught up with him near Paris, Texas on Aug. 6, 1874, when Jim Reed was shot to death while trying to escape from the custody of a deputy sheriff. Belle put her children in the care of relatives, left Texas, and took up with the Starr clan in the Indian Territory west of Fort Smith, Arkansas. During this time she became fully immersed in the outlaw life–organizing, planning and fencing for the rustlers, horse thieves and bootleggers, as well as harboring them from the law. Belle’s illegal enterprises were lucrative enough for her to employ bribery to free her cohorts from the law whenever they were caught. When she was unable to buy off the lawmen, she was known to seduce them in return for looking the other way. Reed’s death left Belle destitute. She had not profited from his life of crime. The next few years of her life are somewhat of a mystery. It is known that her father died in 1876 and that her mother sold the farm and moved to Dallas. Belle also sold her farm and apparently spent a lot of time at the Reed home in Missouri. Some have speculated that Belle’ was involved in such activities as burning down a store; robbing a bank; being jailed for horse stealing, and then eloping with her jailer; robbing a poker game at gunpoint; and running a livery stable, then fencing stolen livestock. Such activities are not, however, reflected in court records or newspaper accounts. Local gossip had it that Belle lived with Bruce Younger for a short time in Kansas. Bruce was an uncle of outlaw Cole Younger and it is speculated that Belle and Bruce were married in Chetopa, Kansas on May 15, 1880. Unfortunately their life of crime quickly took it’s toll on the Starr’s. On December 17, 1866 the Starrs were attending a friend’s Christmas party when Sam encountered an old enemy, Frank West. He threw down on West and shot him dead, but not before being fatally wounded himself. The widow Starr returned to Younger’s Bend and took Jack Spaniard, a notorious outlaw, to her bed almost before Sam’s body was cold. Belle’s new arrangement was cut short when Spaniard was arrested, tried for murder, found guilty and hanged. 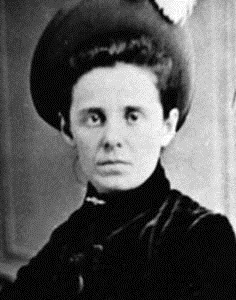 The notoriously unlawful life of Belle Starr came to a violent end on Feb. 3, 1889, two days short of her forty-first birthday. While riding Belle was killed by a shotgun blast to the back, shoulder, and face. Suspects included Edgar Watson, with whom Belle had been feuding over the land he was renting from her (Watson was a fugitive and Belle had been told by the authorities that she would lose all of her land if caught harboring fugitives and for once she was obeying), her lover a Cherokee named Jim July with whom she had recently had a quarrel, and her son Ed, with whom she had had a strained relationship. However, the identity of the murderer of Belle Starr was never identified. Belle Starr was buried on her ranch. Even in her lifetime Belle Starr had become a legend through the yellow journalism of her day. This status would be reinforced through the years—in addition to the press-dime novel literature and the Hollywood motion picture industry. The result is that today historians continue attempting to decipher the facts of Belle Starr’s life from the fiction. Rascoe, Burton. Belle Starr “The Bandit Queen.” Bison Books, 2004. Shirley, Glenn. Belle Starr and Her Times: The Literature, the Facts, and the Legends. University of Oklahoma Press, 1990.